We’ve rounded up all the betting offers for the Australian Open. Find out how you can earn free bets, get money back on losses and enter competitions to earn top prizes. This is almost certainly to be the last Grand Slam with the big four of Murray, Federer Djokovic and Nadal all playing. A lot of the UK coverage has been on his imminent retirement. Whether that is the Australian Open or Wimbledon, it almost looks to be ceremonial any appearance. Bookmakers promote this tournament heavily, being a Grand Slam. This year, however, there are more offers than ever before. Many will span the entire tournament, while others may be available for a specific day. We’ll keep this article updated as the tournament progresses. Place £10+ on any of the semi-finals, and you’ll receive a free Power Up. Both women’s and the men’s matches apply for this offer, and the Power Up must be used within 24 hours. Paddy Power have had a similar offer throughout the tournament (previously it was to place an acca to trigger the free power up) so we expect to see something for the final too. This offer is one that Paddy Power have had for many of the Grand Slams for years now. They will pay out your bet in full if your selection is winning by two sets in the match regardless if your selection goes on to lose. Place 3 x £5 in-play bets on a single day, and Coral will give you a £5 free bet. The free bet can be used on any in-play tennis market. Because the time zones are different for Australia, there is guidance about what counts as a day. Bets placed between 00:01 and 13.00 will count as a single day. You can receive one free bet each day of the tournament. This is similar to the Coral offer but requires an additional 2 x £5 bets to unlock. Place 5 x £5 in-play bets in a day on the Australian Open, and you’ll receive a free in-play bet. Once you’ve placed the five qualifying bets, a pop-up window will open allowing you to claim your free bet. Almost identical to the MansionBet offer, place five £5+ bets in a single day and you’ll receive a £5 free bet. This is the same offer Boylesports had for the US Open. Back a player to win any match at the Australian Open, and if they lose the first set, but go on to win the match, then Boylesports will pay double winnings. The extra winnings will be paid as a free bet. There is a maximum stake of £20 per customer, and the maximum free bet that can be awarded is £500. You must opt-in to receive this offer. Available for all men’s and women’s matches. Again, this is an offer Ladbrokes had for the US Open. Get 10% cash back on net losses up to £100 when you bet on tennis with Ladbrokes. Net losses are calculated on the calendar week. Aside from free bets and enhancements, there are some competitions that you can enter with cash prizes. Unibet have a couple of different competitions for the Australian Open. Unibet have a daily raffle with the winner scooping £5,000 for 12 days. On the final day, the prize is £10,000 so in total, they are giving away £75,000. 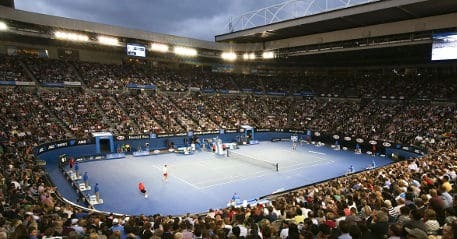 For every £5 you wager on the Australian Open, you’ll receive a ticket to enter the raffle. There is no limit on the number of tickets you can collect, and the draw takes place at 14.00 GMT daily. In addition to the jackpot, Unibet are running a leaderboard and the player with the most points wins £10,000. There is a prize of £5,000 and £3,000 for third. Everyone in the top 20 will cash prize. Points are accumulated from winning bets. Specifically, they’re worked out by the amount staked x number of events x total odds. Only bets on the Australian Open count and the players with the most points top the leaderboard. At the beginning of the tournament, Djokovic is favourite. These odds are sourced from bet365, are accurate at the time of publishing and are subject to change. For those in the UK, you can pretty much forget about going to bed. Coverage starts at around 1:30 am each day and runs throughout the night. Early birds will get to see a match early in the morning. All matches are broadcast on Eurosport. bet365 have the games live to stream too.